Dawn simulators have been around since the late 1800’s, believe it or not (back then it was called “mechanical sunrise”)! Over the years, as technology increased, more and more dawn simulators have been created to more closely mimic nature, with the added benefit of new features and improvements. There are several important factors to consider in choosing the best dawn simulator, but don’t worry — I will break it down for you! Light intensity is measured in lux (lx), which is equivalent to lumens per square meter (lm/m2) (I explain this in a little more detail here). A high lux level indicates an intense concentration of light. The lux value that reaches our eyes is perhaps the most important indicator of the efficacy of a light source in affecting our wake response and in the treatment of Seasonal Affective Disorder/Winter Depression. 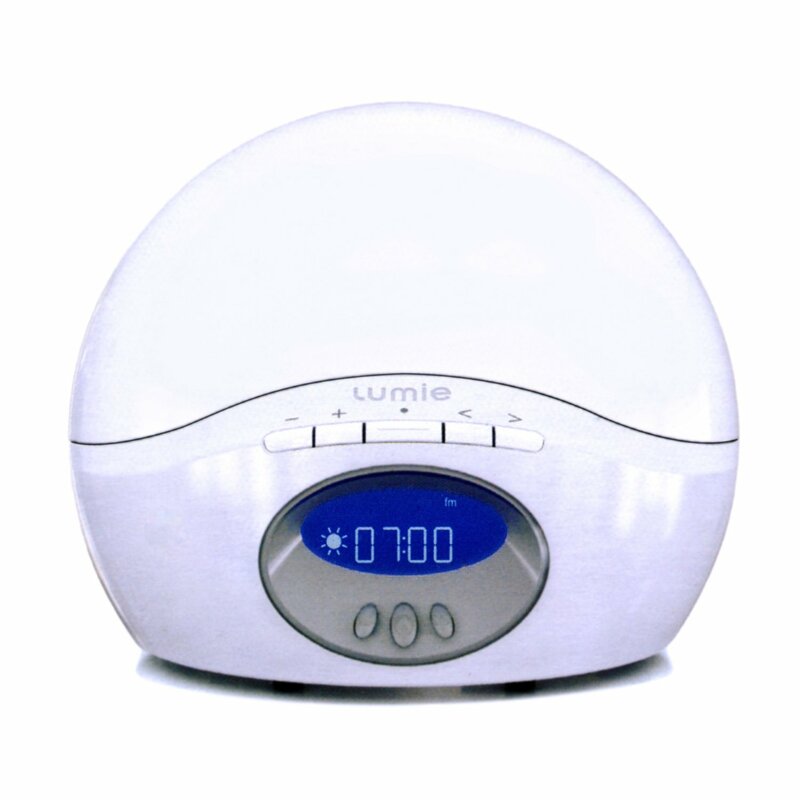 Research indicates that light intensity around 10,000 lux, which is on the lower end of indirect sunlight, applied for 30 minutes post-awakening, is the optimum level for SAD treatment with a light therapy lamp. However, for dawn simulation, 200 to 300 lux has been shown to be just as effective since the light is applied earlier and for longer (as you sleep)! Manufacturers don’t always state at what distance the rated lux applies. If a light source is providing 10,000 lux at only six inches, it will not be as effective since it’s likely placed on your bedside table two or three feet away from your face, so be sure to ask if this distance information is not provided. The lux that reaches a surface decreased by as much as a fourth as the distance doubles. Color temperature is measured in Kelvins (K), which is a thermodynamic temperature scale. Without getting too technical, we’re only talking about the expected color of an object having a certain surface temperature — reddish yellow indicates a low color temperature, while blueish-white is a high color temperature. In regards to dawn simulation, what we’re interested in is the approximate color temperature of the Sun, which is around 5600K. It’s not a hard and fast rule that your dawn simulator have this color temperature, and in fact, a wide range of color temperatures have been shown to be effective, so it really comes down to personal preference. Typically, we want to stay in the warmer colors 5600K and below. My dawn simulator has a color temperature of around 2700K. With the science out of the way, the rest boils down to budget and features. If you’re after all the bells and whistles, expect to pay closer to $200. If you’re a budget-conscious DIYer, then you can get by with the lamp, wall timer, and covered CFL bulb that you already have lying around your home. And, of course, there’s something for every price point in between. Replaceable bulb or LED. Newer dawn simulators use LED bulbs that may not need to be replaced in the life of the device. Some Philips Wake Up Lights now have LEDs that are rated for 20 years of use! However, other dawn simulators use halogen, incandescent, or compact fluorescent bulbs which may blow out after a few years of use. If you choose one of these devices, ensure the bulb can be easily replaced. Dimmable display. If you’re easily affected by light, as most folks who in search of a dawn simulator are, then you’re going to want to control light levels as you fall asleep in addition to when you’re waking up. As such, you don’t want a bright LED time shining in your face at bedtime. Many dawn simulators feature a dimmable display which greatly reduces the brightness of the time display at the touch of a button. Battery backup. If you rely solely on your dawn simulator to wake you up, then a battery backup may be a requirement. If, like me, you use a secondary device, such as your cell phone alarm, as part of your wake-up routine, this may be less of a consideration. Sunrise duration. The length of time the wake-up light takes to simulate the dawn can vary the effect on your mood, if you’re using the lamp to treat depression symptoms. Studies have shown a significant reduction in depression symptoms at 2 hours vs 30 minutes at 250 lux of light exposure. Look for this number and if this feature is adjustable, when choosing a wake-up light. Do you need the device to function as a bed-side lamp, too? Do you have trouble falling asleep? If so, some devices simulate sunset as well as sunrise. Do nature sounds help you to fall asleep or wake up? Do you want to wake to FM radio? Spencer created Wake to Light in 2015 to help folks wake up early, naturally, and happily. Which Philips Wake Up Light is the Best? WakeToLight.com is a participant in the Amazon Services LLC Associates Program, an affiliate advertising program designed to provide a means for sites to earn advertising fees by advertising and linking to Amazon.com. Please see the affiliate disclosure for details on how your support in this and other programs helps to keep this site in operation. Wake To Light Copyright © 2019.